The latest change of course on the proposed sales tax hike in Japan combined with by a further delayed timeline by the Central Bank to meet the 2.00% inflation goal have nearly put the nails in the coffin for Abenomics. Although ambitious, the arrows have fallen short of target, placing immense appreciative pressures on the currency as policymakers struggle to induce growth and weaken the currency. Not helping, particularly for the GBPJPY pair, is the fact that the looming UK referendum on EU membership has seen market participants more anxious about the future of the economy, contributing to weakness in the Pound. With both Japan and the UK feeling the heat of the disinflationary and deflationary forces encircling the globe, the outlook for both economies remains challenging, greatly diminishing the chance of a recovery in GBPJPY over the medium-term. Japanese Prime Minister Shinzo Abe’s efforts to go ahead and restore the Japanese economy have been ambitious, but unfortunately fallen short of the high expectations he set when making his political comeback. The installation of easy money central bankers and pro-stimulus ministers had an immediate impact, helping to depreciate the Yen while feeding record corporate profitability, however, the efforts proved unsustainable. Now, with the cracks appearing, it is becoming apparent that Japan must decide between larger, more epic monetary stimulus, reducing rates further, other fiscal measures such as the now touted equal pay initiative, or dealing with the consequences of a rising Yen and the havoc it could wreak on the economy. 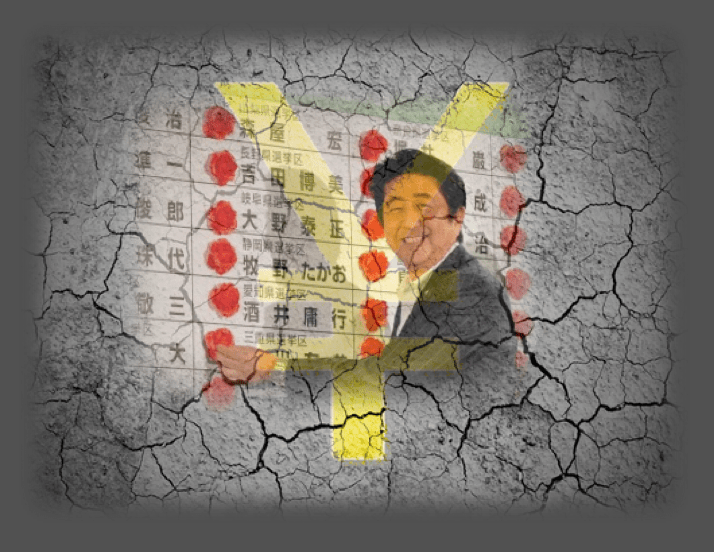 The latest sign to emerge that Abenomics was missing milestones was the recent announcement by Abe that the sales tax hike would be postponed in light of the potential to thrust the country further into deflation. While logically sensible considering any tax hike was likely to reduce consumption, it shows that officials are running out of tools to fight deflation. However, the Central Bank risks running afoul of other global power centers if they act deliberately to weaken the Yen, a factor that might very well help spur growth in the economy. While immediately risk factors remain to the upside for the Yen, the BoJ could unilaterally act to devalue the currency, the ripple effects of which would have widespread implications. While the vote itself of remaining a member of the European Union or leaving is a contentious issue across the nation, the UK economy has suffered as a result of the worsening visibility going forward. As a result of the uncertainty, business investment has fallen across the nation as companies gear up for the potential challenges that could emerge should the UK electorate determine that it is indeed time to leave. One of the problems with this situation is the fact that no one quite knows how the economy will be impacted, either positively or negatively over the short-term, adding to volatility in the UK Pound. However, one thing is for certain, the vote will prove a chaotic time for financial markets as they digest and react to outcome. Although price-momentum has recently found itself more range bound, trading between key resistance at 163.88 and support at 151.91, the consolidation may soon lead to a directional breakout. However, when it comes to the prevailing trend, certain indicators suggest that the downside bias remains considerable. 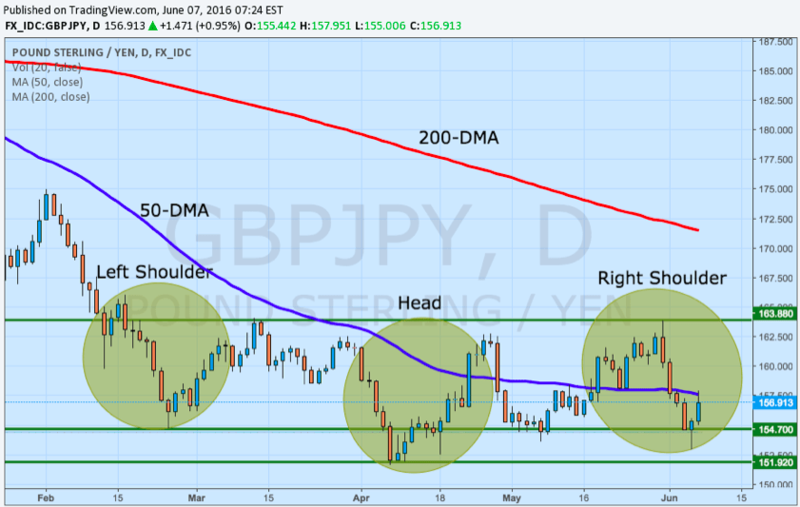 With both the 50-day and 200-day moving averages trending lower above the price action, each are acting as resistance against any further upside momentum especially after GBPJPY’s bounce on Monday from lows last seen in April. Even with the signs that a head and shoulders bullish pattern is emerging with the head at 151.67, shoulder line at 154.70, the neck line at 163.88 remains the level to overcome. On a purely technical basis, the medium-term uptrend beginning from April lows is not technically intact after Monday’s low was below the mid-May low. A close below 154.70 might indicate the resumption of the downtrend after this brief pause. However, the real driver of price action over the coming days and weeks will not necessarily be the technical aspects but rather the fundamental backdrop. The polls surrounding the Brexit vote have had a tremendous impact on the Pound recently, creating an environment of high volatility, even in GBPJPY. While Abe has been unable to pressure the Yen lower, it has created an environment that is highly bearish for the pair. The immediate risk factors that could drive GBPJPY lower is the upcoming GDP revision for the first quarter due Wednesday morning. Although expected to be upgrade to 0.50% a factor that may push the Yen lower, a negative reading could see the currency surge higher. UK data will be relatively light this week, with manufacturing figures standing out as the main event. However, as the final countdown to the vote begins, volatility in the Pound will heat up, adding to the potential breakout force in the GBPJPY pair over the coming weeks.